Your Renewable Licence has expired. A Renewable Licence requires payment of an annual renewal fee in order to receive a Licence Activation Key (by e-mail). Until you enter a valid Licence Activation Key, the software will function in Evaluation Mode. If you have recently been provided with a Licence Activation Key by Mincad Systems, start APSDSagain so you can enter the Key. If you have not received a Licence Activation Key yet, please contact Mincad Systems or your local agent. If you have a Site Licence or a temporary Licence, the licence information is supplied to APSDS via a Licence Key File. This file is missing. If you have a Site Licence or a temporary Licence, the licence information is supplied to APSDS via a Licence Key File. This file is corrupt. If you have a Site Licence or a temporary Licence, the licence information is supplied to APSDS via a Licence Key File. This Licence Key has expired. If you have a Site Licence or a temporary Licence, the licence information is supplied to APSDS via a Licence Key File. This file has an Unspecified Error. The folder that APSDS is using to store your data files is not writable. Contact your IT Administrator for assistance (make sure you note the data folder – it is defined in the APSDS error message). APSDS is unable to write to the file APSDS5.INI (in the Windows folder, for example C:WINDOWS). Contact your IT Administrator for assistance (make sure you note the Windows folder – it is defined in the APSDS error message). The folder that APSDS is using to store settings is not writable. Contact your IT Administrator for assistance (make sure you note the settings folder – it is defined in the APSDS error message). Please send your database files so that we can diagnose the problem. The data folder will be shown in the “Data Path” field. By default this will be “C:UsersPublicPublic DocumentsMincad SystemsAPSDS5data”. Email the the database files LAYERS.MDB and LOADS.MDB. When you look for the database files in Windows Explorer they will be of type “Microsoft Access Application” and the size will be at least 160 kb. When you click the “Run Analysis” button, APSDS 5.0 uses APSDS32.exe to perform the numerical analysis. This error is usually caused by APSDS32.exe not having the correct permissions to be executed by APSDS 5.0. Check with your System Administrator that APSDS32.exe is not being blocked by your Firewall. This error is very rare, but the combination of input data that you are using cannot be analysed. We are currently working on a fix for this problem. In the interim, try modifying one or more of your parameters such as layer thicknesses or material properties to see if that can be analysed without this error. You are welcome to send your data files so that we can diagnose the problem. Email the .cls and .sto files for the job that is giving the error and the database files LAYERS.MDB and LOADS.MDB. The error/warning that you have encountered may not be accurate. Please update to the latest version of APSDS – this may give you a more accurate diagnosis. Click here to download the APSDS 5.0 installer. Can I model geogrids or geofabrics in layered elastic programs like CIRCLY, HIPAVE or APSDS? We do not believe it is possible to explicitly represent the behaviour of geogrids or geofabrics in layered elastic programs like CIRCLY, HIPAVE or APSDS. On the other hand the most promising approach is to implicitly include the geosynthetic behaviour by using modified performance characteristics for the adjoining materials. We are now using an enhanced Licence Activation Key format. Sorry, the Licence Activation Key is not the correct length. Please contact Mincad Systems to get a replacement Licence Activation Key. In this case you need to update to the latest software version. If you have a Hardware Lock for APSDS, you need to install a special driver. Download and install the Hardware Lock Driver. Under normal circumstances a single user licence for CIRCLY, HIPAVE or APSDS requires you to use a Hardware Lock (aka “Sentinel” or “Dongle”). If you are just evaluating CIRCLY, HIPAVE or APSDS OR using CIRCLY, HIPAVE or APSDS for CPEE assignments, CIRCLY, HIPAVE or APSDS will operate in “evaluation mode” without a Hardware Lock. To see the restrictions of “evaluation mode”, click one of these links: CIRCLY, HIPAVE, APSDS 5.0. Please Note that if you attempt to run CIRCLY, HIPAVE or APSDS that is usually protected by a Hardware Lock in standalone mode via a remote client (Terminal Server, VNC, WinXP remote client…), the software will not allow this for security reasons. 1. If your Hardware Lock uses a parallel printer port – check that the port is working by printing a test page on your printer. 2. Try installing CIRCLY, HIPAVE or APSDS on another PC and check that the Hardware Lock works on that PC. 3. Make sure you connect the Hardware Lock directly to your PC – do not connect it via any sort of device such as USB hub, port replicater, docking station etc. 4. Download the End-User Troubleshooting Guide for Sentinel SuperPro/UltraPro and Sentinel Hardware Keys. Read the section Key Not Found starting on page 19. If your are unable to configure your Parallel Port successfully, we can replace your Parallel Hardware Lock with a USB one. We will replace a defective Hardware Lock. Please contact Mincad Systems or your local agent to arrange a replacement for your Hardware Lock. This error can result from a faulty driver configuration or from a faulty hardware lock. Start with the Quick Install/Uninstall on page 3.
go to: /knowledge-base/hardware-lock-driver download this file and run it to install the Hardware Lock driver. If the Hardware Lock still gives that error: contact Mincad Systems or your local agent to arrange a replacement for your Hardware Lock. You have more than one Mincad Systems Hardware Lock connected to your computer. Please unplug all the Mincad Systems Hardware Locks, except the one for the program you are currently running. Restart the program after you have the correct Hardware Lock connected. Your Hardware Lock has been reported as lost or replaced. Please contact Mincad Systems or your local agent for further assistance. You must key in a special activation code to set the Hardware Lock to run APSDS 5.0. Make sure you have your activation code handy before proceeding. Before doing this you must have installed the Sentinel System Driver (click here for instructions) ANDAPSDS 5.0 for the first time. Copy the key to the Windows clipboard (by highlighting it and then Control+C). Make sure your Hardware Lock is plugged in. Start APSDS 5.0 from the Windows Start menu (APSDS 5.0/APSDS 5.0). Paste (Control+V) your Licence Activation Key into the box, then click the “Process Key” button. The PC that you are sitting in front of must be running CIRCLY, HIPAVE or APSDS and the Hardware Lock must be plugged in to that PC. 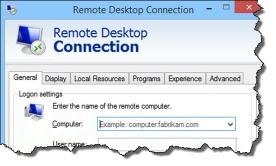 For security reasons we do not permit you to run CIRCLY, HIPAVE or APSDS remotely via a remote client such as Remote Desktop, Terminal Server, VNC or WinXP remote client. APSDS uses two database files, LOADS.mdb and LAYERS.mdb to store nearly all the data such as material properties and load data. The database files are managed by the Microsoft Jet database engine. Although theoretically these files can be shared by multiple users, the version of APSDS that you are using is configured for single user (i.e. exclusive) operation. APSDS is reporting that one or both of the database files has/have already been opened. Read What is an .LDB File? Check if there are .ldb file(s) in the same folder as the .mdb files. If there are, delete them. You may need to reboot to delete them. For databases on network computers, go to the level that is shared. Usually that is an entire drive. Right click on it and select “Sharing and Security”. Make sure “Share this folder” is selected and there is a share name that does not have a dollar sign ($) behind it in the drop down box. (The dollar sign share is a default share for administrator only.) If there is not one, add it. Select a share without a dollar sign. Select permissions. Make sure the users that will be using the DB have change and read permissions. Then right click on the folder(s) that contain the database(s) and select “Sharing and Security”. Select security. Make sure the users have read, write, modify, and read & execute permissions. Select advanced. Edit the users that will access the databases. Make sure they have create files and delete permissions. Then right click on the the database(s) and select “Sharing and Security”. Select security. Make sure the users have read, write, modify, and read & execute permissions. If you still cannot open it, the database may be corrupt. Install APSDS on another PC. Copy the APSDS data files to another PC (instructions here), and see if you can view the data from APSDS on that PC. Do you have a backup that you can restore from? If are still stuck, email your data files to Mincad Systems. Contact Mincad Systems to get a link to the latest version. If that doesn’t resolve the problem, please contact Mincad Systems or your local agent for further assistance. Download the Hardware Lock Driver from here. After launching Sentinel Protection Installer 7.6.9.exe, follow the steps in this screencast. Keywords: Hardware Lock Driver, Sentinel Driver, Dongle Driver, Parallel Port, Printer Port. How can I get an evaluation version of APSDS 5.0? There is only one version of APSDS 5.0 – and it can be used in evaluation mode. Click here to download the latest release of APSDS 5.0. How do I transfer my APSDS 5.0 files to another PC? Make sure all instances of APSDS are closed. Of course, if the destination PC has important APSDS data you should back up those files first. APSDS 5.0 can be run over a network, in the sense that the data files can stored and shared on a remote server or workstation. For the following procedure to work, it is assumed that the APSDS 5.0 data files are already installed on the server – (the core data files are *.sds and *.mdb). 2. In Windows Explorer, open “My Network Places” and navigate to the server, then to the drive where APSDS is installed. 3. Click the Right mouse button and click “Map Network Drive”. This dialog will let you assign a drive letter, for example, “M:” to the remove drive. (You may need to specify a password). 4. Now start APSDS on the client. (here M is the drive letter assigned in step 3). You should now be able to run APSDS on the client, while all data files are stored on the server. Note: The Hardware Lock must be plugged into the client PC to successfully run APSDS analyses. What APSDS 5.0 files do I need to backup? By default this will be “C:UsersPublicDocumentsMincad SystemsAPSDS5data”. At the very minimum you only need to back-up all the *.sds files and the database files LAYERS.MDB and LOADS.MDB. There is only one possible catch. APSDS is designed to use the latest (and only the latest) versions of the relevant data from the databases when you run an analysis. If you change ANY of the data that was used by previously run jobs, if you run those jobs again they will use the latest data, not the historical data. This is by design. To ensure that you can check the actual data that was used in any given analysis you should back-up all the *.cli files too. What are the limitations of APSDS 5.0 Evaluation Mode? In evaluation mode you can evaluate many of the features including analysing the two Example problems. APSDS will operate in Evaluation Mode if you do not have an Annual APSDS Licence. 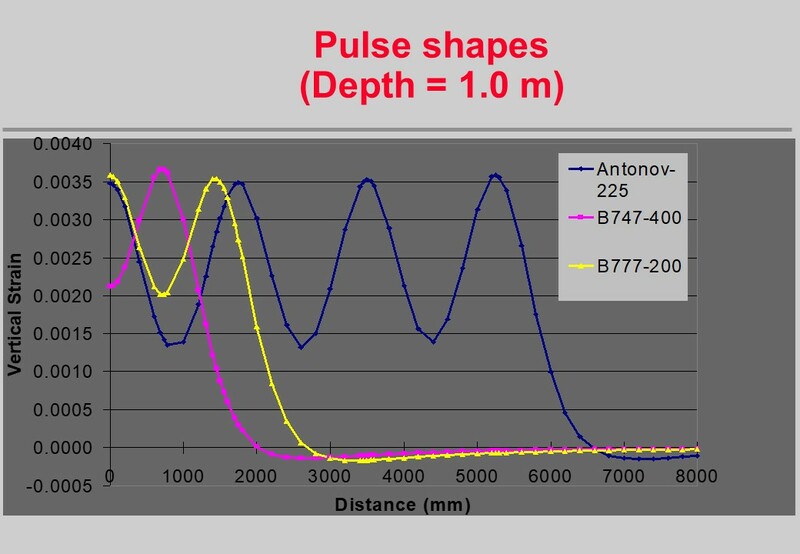 You can use the Automatic Thickness Design and Parametric Analysis features. Please note: APSDS in Evaluation Mode is solely for demonstration or educational purposes and may not be used for commercial purposes of any kind. Are you doing a CPEE Unit? We have made APSDS available to CPEE students to facilitate completion of relevant design assignments. You can use APSDS in evaluation mode to analyse your assignments. 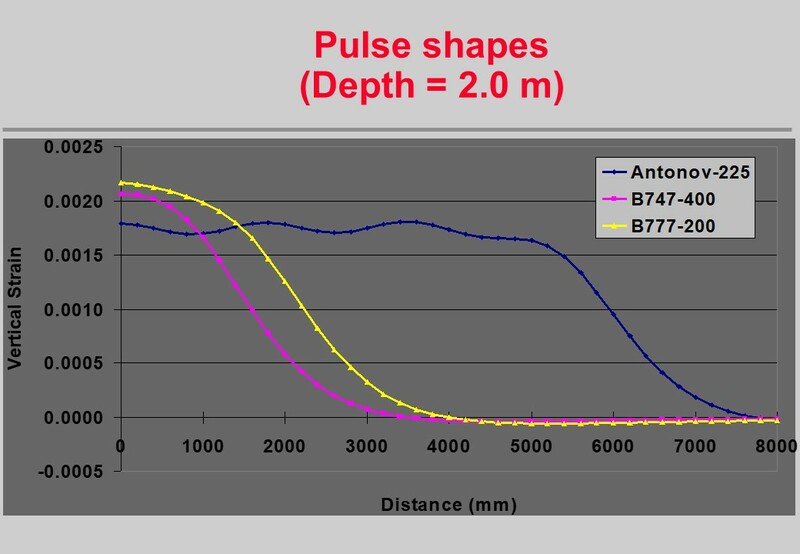 There is no restriction on TOTAL Pavement thickness as long as you are using the material properties specified by your assignments. By default this will be “C:UsersPublicDocumentsMincad SystemsCIRCLY5”. When you click the “Run Analysis” button, CIRCLY 5.x uses CIRCLY32.exe to perform the numerical analysis. By default this will be “C:UsersPublicDocumentsMincad SystemsCIRCLY5data”. Click here to download the latest releases of CIRCLY. If you have recently been provided with a Licence Activation Key by Mincad Systems, start CIRCLYagain so you can enter the Key. If you have a Site Licence or a temporary Licence, the licence information is supplied to CIRCLY via a Licence Key File. This file is corrupt. If you have a Site Licence or a temporary Licence, the licence information is supplied to CIRCLY via a Licence Key File. This Licence Key has expired. The folder that CIRCLY is using to store your data files is not writable. Contact your IT Administrator for assistance (make sure you note the data folder – it is defined in the CIRCLY error message). CIRCLY is unable to write to the file CIRCLY5.INI (for CIRCLY 5.x), CIRCLY6.INI (for CIRCLY 6.0) or CIRCLY7.0.INI (for CIRCLY 7.0) (in the Windows folder, for example C:WINDOWS). Contact your IT Administrator for assistance (make sure you note the Windows folder – it is defined in the CIRCLY error message). The folder that CIRCLY is using to store settings is not writable. Contact your IT Administrator for assistance (make sure you note the settings folder – it is defined in the CIRCLY error message). Please update to the latest version of CIRCLY – this may give you a more accurate diagnosis. If you have a Hardware Lock for CIRCLY, you need to install a special driver. You must key in a special activation code to set the Hardware Lock to run this CIRCLY Version. Make sure you have your activation code handy before proceeding. Before doing this you must have installed the Sentinel System Driver (click here for instructions) AND CIRCLY the first time. Make sure your CIRCLY/APSDS Hardware Lock is plugged in. Start CIRCLY from the Windows Start menu. Your CIRCLY 5.0 Perpetual Licence is not valid for CIRCLY 5.1 or later. A CIRCLY 5.0 Perpetual Licence allows you to use CIRCLY 5.0 for as long as you want. CIRCLY 5.0 will continue to operate on any versions of Windows prior to Windows 8. CIRCLY 5.0 will not operate on Windows 8.1 or Windows 10. CIRCLY 5.0 will no longer be maintained or supported after 1 November 2012. With a CIRCLY Annual Licence you will be able to use the latest version of CIRCLY and keep receiving maintenance and support (or to use Windows 8.1 or Windows 10). You pay annually in advance with an Annual Licence. There are no further charges for support and maintenance and you receive major upgrades such as CIRCLY 6.0. The Annual Licence price may increase in future years in line with list prices. CIRCLY 5.0 Maintenance and Support was discontinued from 1 November 2012. You should upgrade to CIRCLY 6.0 (at no charge) as this will ensure that you have the most up to date version of the program. Click here to upgrade to CIRCLY 6.0. Remember that if you intend to use Windows 8.1 or Windows 10, that you must install CIRCLY 6.0 (CIRCLY 5.0 cannot be used). If you have a CIRCLY 5.0 Perpetual Licence: A CIRCLY 5.0 Perpetual Licence allows you to use CIRCLY 5.0 for as long as you want. CIRCLY 5.0 will continue to operate on any versions of Windows prior to Windows 8. You will need to order a CIRCLY Annual Licence to keep receiving maintenance and support (or to use Windows 8 or any future version of Windows). You pay annually in advance with an Annual Licence. There are no further charges for support and maintenance and you receive major upgrades such as CIRCLY 6.0. The Annual Licence price may increase in future years in line with list prices. CIRCLY uses two database files, LOADS.mdb and LAYERS.mdb to store nearly all the data such as material properties and load data. Although theoretically these files can be shared by multiple users, the version of CIRCLY that you are using is configured for single user (i.e. exclusive) operation. CIRCLY is reporting that one or both of the database files has/have already been opened. Install CIRCLY on another PC. Copy the CIRCLY data files to another PC (instructions here), and see if you can view the data from CIRCLY on that PC. How can I generate a 3D graph in CIRCLY 5.1? 1. Calculate Selected Results at User-defined z-Values (see User Manual, Page 34). This will let you define the uniform grid of points as shown on the lower part of Page 29. How do I transfer my CIRCLY 5.1 files to another PC? Make sure all instances of CIRCLY are closed. Of course, if the destination PC has important CIRCLY data you should back up those files first. CIRCLY 5.1 can be run over a network, in the sense that the data files can stored and shared on a remote server or workstation. For the following procedure to work, it is assumed that the CIRCLY 5.1 data files are already installed on the server – (the core data files are *.cls and *.mdb). 2. In Windows Explorer, open “My Network Places” and navigate to the server, then to the drive where CIRCLY is installed. 4. Now start CIRCLY on the client. You should now be able to run CIRCLY on the client, while all data files are stored on the server. Note: The Hardware Lock must be plugged into the client PC to successfully run CIRCLY analyses. What are the limitations of CIRCLY Evaluation Mode? There is only one version of CIRCLY 5.1 , CIRCLY 6.0 and CIRCLY 7.0 – and they can be used in evaluation mode. 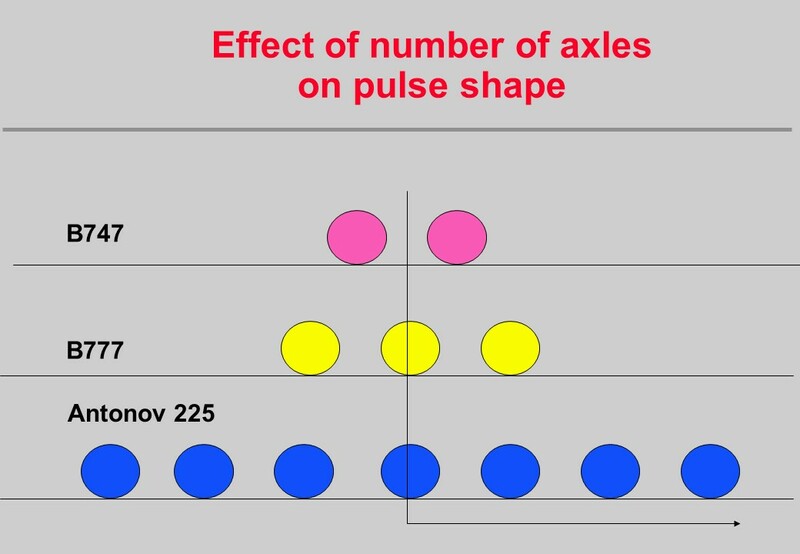 The TOTAL Pavement thickness must be 260 mm, 475 mm or 525 mm. 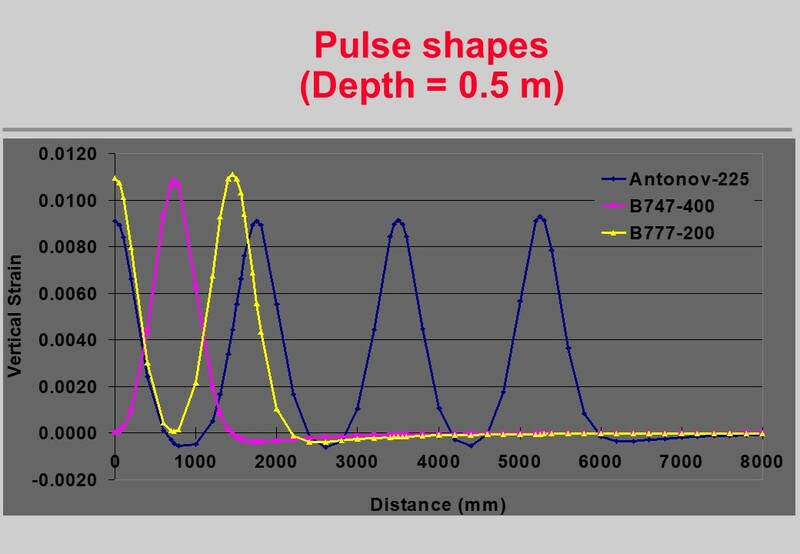 Please note that the Automatic Thickness Design and Parametric Analysis features are de-activated in evaluation mode. We have made CIRCLY available to CPEE students to facilitate completion of relevant design assignments. You can use CIRCLY in Evaluation Mode to analyse your assignments. What CIRCLY 5.1 files do I need to backup? At the very minimum you only need to back-up all the *.cls files and the database files LAYERS.MDBand LOADS.MDB. CIRCLY is designed to use the latest (and only the latest) versions of the relevant data from the databases when you run an analysis. If you change ANY of the data that was used by previously run jobs, if you run those jobs again they will use the latest data, not the historical data. This is by design. Where can I download the CIRCLY User Manual? Click here to download the CIRCLY User Manual and software. Where can I download the Program CIRCLY Theory and Background Manual? Click here to download the CIRCLY Manuals and software. Usually when you install CIRCLY 6.0 the default data folder will be C:UsersPublicDocumentsMincad SystemsCIRCLY6data. You can switch CIRCLY to a different data directory/folder. Lets say you want to create a data folder called C:UsersPublicDocumentsMincad SystemsCIRCLY6dataProject XYZ. (1) You need to create the folder first if it does not already exist. (2) You must copy the database files (LOADS6.CMDB and LAYERS6.CMDB) to this folder, along with any .CLS files for previous jobs that you may wish to reuse from this folder. You switch to the new folder by selecting the directory path using the Options menu (or the icon on the toolbar). This can be done using the Browse button, or can be pasted from the Windows clipboard. Note that if you use multiple data folders, the databases that you will generate cannot be automatically merged into single databases again. When you click the “Run Analysis” button, CIRCLY 6.0 uses CIRCLY32.exe to perform the numerical analysis. By default this will be “C:UsersPublicDocumentsMincad SystemsCIRCLY6data”. Email the .cls and .sto files for the job that is giving the error and the database files LAYERS6.CMDB and LOADS6.CMDB. This is a forthcoming feature. If you have records for Materials etc. that have the same IDs in both CIRCLY 6.0 and CIRCLY 7.0, the CIRCLY 7.0 values will not be overwritten. 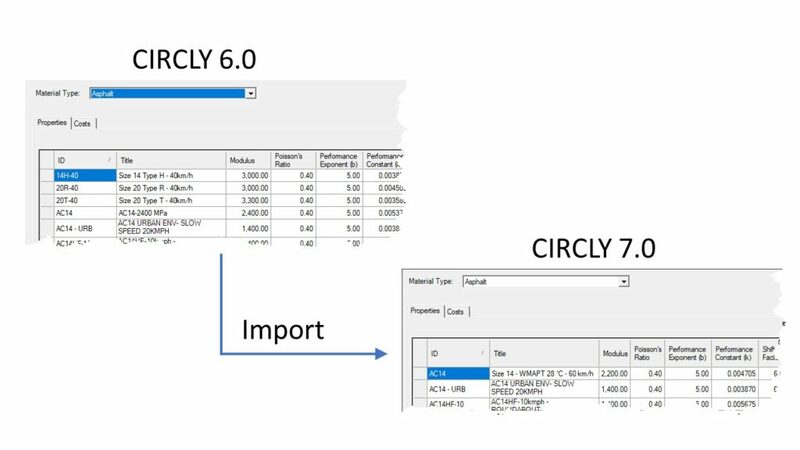 There is no way to automatically transfer all job data from CIRCLY 6.0 to CIRCLY 7.0 due to the differences in the CIRCLY 6.0 and CIRCLY 7.0 Austroads Design Methods. This is because the CIRCLY 6.0 job files only have values for DESA and SAR/ESA (Traffic Multipliers) for each material. 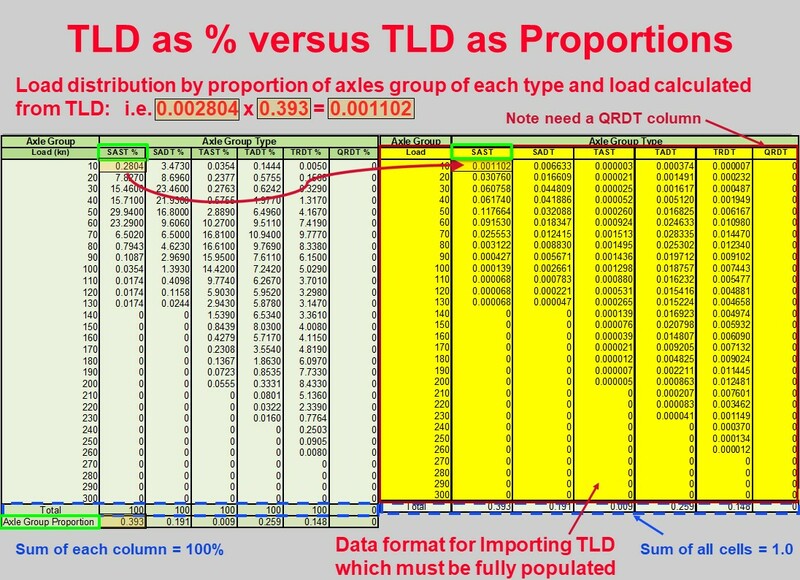 There is no automatic way to replace these properties with a Traffic Load Distribution (TLD) and Design Traffic (NDT) as required by CIRCLY 7.0. Click here for more information on Importing your TLDs. If you have a Site Licence or a temporary Licence, the licence information is supplied to CIRCLY via a Licence Key File. This file is missing. How can I get an evaluation version of CIRCLY 6.0? There is only one version of CIRCLY 6.0 – and it can be used in evaluation mode. Click here to download the latest release of CIRCLY 6.0. How do I transfer my CIRCLY 6.0 files to another PC? CIRCLY 6.0 can be run over a network, in the sense that the data files can stored and shared on a remote server or workstation. For the following procedure to work, it is assumed that the CIRCLY 6.0 data files are already installed on the server – (the core data files are *.cls and *.cmdb). 2. In Windows Explorer, open “My Network Places” and navigate to the server, then to the drive where the CIRCLY data is stored. 3. Now start CIRCLY on the client. What are the limitations of CIRCLY 7.0 Evaluation Mode? There is only one version of CIRCLY 7.0 – and it can be used in Evaluation Mode. We have made CIRCLY 7.0 available to CPEE students to facilitate completion of relevant design assignments. You can use CIRCLY 7.0 in Evaluation Mode to analyse your assignments. What CIRCLY 6.0 files do I need to backup? At the very minimum you only need to back-up all the *.cls files and the database files LAYERS6.CMDB and LOADS6.CMDB. HIPAVE uses two database files, LOADS.mdb and LAYERS.mdb to store nearly all the data such as material properties and load data. Although theoretically these files can be shared by multiple users, the version of HIPAVE that you are using is configured for single user (i.e. exclusive) operation. HIPAVE is reporting that one or both of the database files has/have already been opened. Install HIPAVE on another PC. Copy the HIPAVE data files to another PC (instructions here), and see if you can view the data from HIPAVE on that PC. The Mincad Systems website appears to be uncontactable or may be down. Please try again in a few hours. If the Mincad Systems website is uncontactable for more than 12 hours please notify us. Check with your System Administrator that HIPAVE.exe is not being blocked from accessing the Internet by your Firewall. There is a problem with our web database when attempting to access version details. The folder that HIPAVE is using to store your data files is not writable. Contact your IT Administrator for assistance (make sure you note the data folder – it is defined in the HIPAVE error message). HIPAVE is unable to write to the file CIRCLY5.INI (in the Windows folder, for example C:WINDOWS). Contact your IT Administrator for assistance (make sure you note the Windows folder – it is defined in the HIPAVE error message). The folder that HIPAVE is using to store settings is not writable. Contact your IT Administrator for assistance (make sure you note the settings folder – it is defined in the HIPAVE error message). By default this will be “C:UsersPublicPublic DocumentsMincad SystemsHIPAVE5data”. When you click the “Run Analysis” button, HIPAVE 5.0 uses HIPAVE32.exe to perform the numerical analysis. This error is usually caused by HIPAVE32.exe not having the correct permissions to be executed by HIPAVE 5.0. Check with your System Administrator that HIPAVE32.exe is not being blocked by your Firewall. Please update to the latest version of HIPAVE – this may give you a more accurate diagnosis. How do I transfer my HIPAVE 5.0 files to another PC? Make sure all instances of HIPAVE are closed. Of course, if the destination PC has important HIPAVE data you should back up those files first. What HIPAVE 5.0 files do I need to backup? At the very minimum you only need to back-up all the *.cls files and the database files LAYERS.MDB and LOADS.MDB. HIPAVE is designed to use the latest (and only the latest) versions of the relevant data from the databases when you run an analysis. If you change ANY of the data that was used by previously run jobs, if you run those jobs again they will use the latest data, not the historical data. This is by design. Download the latest release of HIPAVE. To access the full capabilities you must already have a licence for HIPAVE 5.0. How can I get an evaluation version of HIPAVE 5.0? There is only one version of HIPAVE 5.0 – and it can be used in Evaluation Mode. Please note: HIPAVE in Evaluation Mode is solely for demonstration or educational purposes and may not be used for commercial purposes of any kind. Click here to download the latest release of HIPAVE 5.0. What are the limitations of HIPAVE Evaluation Mode? HIPAVE will operate in Evaluation Mode if you do not have an Annual HIPAVE Licence. Where can I download the HIPAVE 5.0 User Manual? Click here to download the HIPAVE 5.0 User Manual and software. If you have a Hardware Lock for HIPAVE 5.0, you need to install a special driver. You must key in a special activation code to set the Hardware Lock to run HIPAVE 5.0. Make sure you have your activation code handy before proceeding. Before doing this you must have installed the Sentinel System Driver (click here for instructions) ANDHIPAVE 5.0 for the first time. Start HIPAVE from the Windows Start menu (HIPAVE 5.0/HIPAVE 5.0). If you have recently been provided with a Licence Activation Key by Mincad Systems, start HIPAVEagain so you can enter the Key. If you have a Site Licence or a temporary Licence, the licence information is supplied to HIPAVE via a Licence Key File. This file is missing. If you have a Site Licence or a temporary Licence, the licence information is supplied to HIPAVE via a Licence Key File. This file is corrupt. If you have a Site Licence or a temporary Licence, the licence information is supplied to HIPAVE via a Licence Key File. This Licence Key has expired. If you have a Site Licence or a temporary Licence, the licence information is supplied to HIPAVE via a Licence Key File. This file has an Unspecified Error. HIPAVE 5.0 can be run over a network, in the sense that the data files can stored and shared on a remote server or workstation. For the following procedure to work, it is assumed that the HIPAVE 5.0 data files are already installed on the server – (the core data files are *.cls and *.mdb). 2. In Windows Explorer, open “My Network Places” and navigate to the server, then to the drive where HIPAVE is installed. 4. Now start HIPAVE on the client. You should now be able to run HIPAVE on the client, while all data files are stored on the server. Note: The Hardware Lock must be plugged into the client PC to successfully run HIPAVE analyses.